For the most part, this is a fairly standard bio. Yes, the real name is ridiculous as usual, and I was unable to find an earlier source for “Slebetor,” so that may be new. The rest of the story (Despondos, the Rebellion, etc.) has already been pretty well established as MOTUC history. The only serious point of contention here is why in Nyarlathotep’s name they felt the need to “mindwipe” Leech (or for that matter, summon him from the depths via a magic spell instead of just recruiting him). This is the second time we’ve seen this, the first being Grizzlor (and Adora may have been at least partly brainwashed, although I’m not sure if it’s been explicitly stated in MOTUC canon). Is Hordak so uncharismatic a leader that his every follower has to be either brainwashed or is actively plotting against him? More importantly, why was it even necessary to use this hoary plot device again at all? Now we have to wonder if Leech is a relatively peaceful fellow who’s been pressed into service against his will. 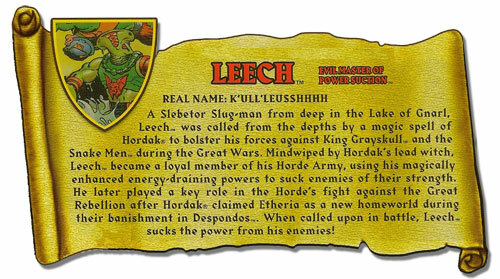 Like Grizzlor and Adora (and perhaps Keldor), Leech is now arguably a victim as much as he’s a villain. Skeletor doesn’t seem to have this problem – his followers may be ambitious (Evil-lyn), argumentative (Tri-Klops), or dumb as rocks (pretty much everyone else), but they’re genuine bad guys. I want to think the odd fact of both Grizzlor and Leech being brainwashed will play into the plot later on – e.g., the brainwashing is somehow reversed and the two turn on Hordak – but I’m afraid I doubt we’ll get a payoff like that. …in a totally unforseen and utterly shocking twist, Evil-Lyn frees virtually the entire Evil Horde from their brainwashed servitude! I always remembered Leech for how horrendously inappropriate his female victims sounded when he drained them. but back to these bios, firstly, they aren't biographical very often, they're a short narrative chopped into paragraphs… not the same thing! sometimes the writing is just so lazy is makes my soul hurt. with just a little more effort, the story could have far, far better and we'd be discussing the story itself, rather than how many mistakes they've made in the latest iteration. Just as long as they make the Christmas Special canon. Brainwashed… Is this the new Second Born son, clone, or Hsss ate my brother? I hate the brainwashing thing. Aside from that, there are two very good nuggets of info in the bio I like. 1. Leech is Eternian. That's pretty big. 2. Leech's powers. While they're obviously innate to his species, Leech's were magically enhanced by the Horde. That at least keeps him unique. In the original idea for the Horde, all of the Horde would have been brainwashed via the Horde logo, which would have been a parasite. I'm willing the reuse of brainwashing is a reference to this.